ImTOO iPhone Video Converter is the best iPhone movie converter software specially designed for iPhone 4, iPhone 3GS, iPhone 3G fans to convert all video files like AVI, MPEG, WMV, DivX, MKV, H.264, AVCHD, MOV, MP4, RM, RMVB, and VOB to iPhone videos perfectly. The video to iPhone converter helps you convert and put movies on iPhone easily. Convert various videos like AVI, MPEG, WMV, DivX, MP4, 3GP to iPhone videos with ease. iPhone Music ConverterConvert music files like MP3, MP2, WMA, RA, AC3, OGG, APE, and CDA to iPhone music MP3, WAV, AAC, AIFF. Extract audio from video as well. CD decoding is also supported. Support for multi-core CPUAutomatically detect CPU. Full support for multi-core CPU makes the conversion speed faster than before. Fully support iPhone 6, iPhone 6 Plus, iPad mini and iPad Air. Convert and move videos to iPhone just in one click. Multithreading and batch conversion mean that you can convert multiple files at the same time. Let you adjust parameters including bit rate, frame rate, sample rate, channel, codec, and aspect ratio. Able to split one file into several and convert any segment of one file with its start time and duration specified. Allow you to add multiple files in the same or different formats to be converted for one source. Bitrate Calculator helps you get the output file size instantly. Capture and save your favorite movie images as JPG, PNG, GIF, BMP when previewing movies with the resizable player which allows you to switch aspect ratio between 4:3 and 16:9. Provides after-done actions (shutdown, exit, hibernate, standby) to free you from having to wait. Supports running in the background and save individual profiles after the parameters have been customized. 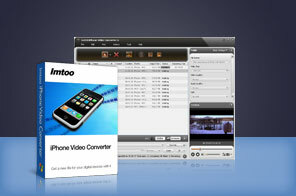 Tutorial : How to convert iPhone videos with ImTOO iPhone Video Converter? How to put movies on iPhone? Convert videos to iPod MP4 format; convert audio files to iPod MP3, M4A and AAC files perfectly.